L: 141" x W: 128" x H: 34"
Midori 6-pc. Leather Power-Reclining Sectional Sofa For a living room with style, comfort and tons of features, choose the Midori 6-piece leather power-reclining sectional sofa. One look and you know you'll be comfortable with soft, pillowed arms and sink-in seat cushions. Stylish contrast topstitching and clean, contemporary design make this sectional the center of attention. Plus, features like the chaise-style power-reclining seats, console power center and cup holders make it so desirable. For a living room with style, comfort and tons of features, choose the Midori 6-piece leather power-reclining sectional sofa. One look and you know you'll be comfortable with soft, pillowed arms and sink-in seat cushions. Stylish contrast topstitching and clean, contemporary design make this sectional the center of attention. Plus, features like the chaise-style power-reclining seats, console power center and cup holders make it so desirable. L: 13" x W: 40" x H: 29"
This was delivered to my house on Saturday. It looks very old and wrinkled as if it's used. The delivery guy told me that it would go away after 2-3 days. Its been 3 days and no improvements. I am extremely disappointed with this purchase. Would not recommend. I have called numerous times and was pushed around to different people. Now I have to wait until the 19th before someone is available to come and check it out. Beautiful sectional. Quality leather smooth reclining very comfortable. It's a big piece so make sure the room has ample space to accommodate it. Beautiful couch I love it! It makes the room stand out! It looks beautiful. The end table and lamp plus the center round table completes a sweeping look, that everyone says is a beautiful modern living room. WOW. I ordered my sectional and it was delivered exactly when I wanted it. 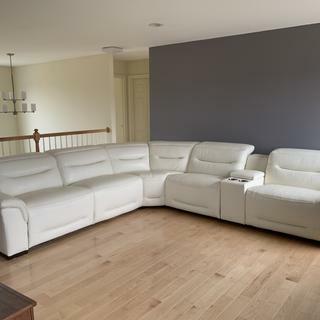 It was delivered on time and the sectional arrived in perfect condition and everything works! R & F are wonderful to deal with and I will recommend them to everyone! In love. Lots of compliments already! We love our new Midori sectional! It's so comfortable to lay down , relax with the family, read a book or watch TV. The console is roomy and the seats are quiet when reclining. The pieces are sturdy and hooked together we'll. Our previous sectional never felt as well connected.. Even the wedges seat on this couch is comfortable!!! The larger seat and 1/2 pieces leave room to cuddle up with my boys. The off-white color has brightened up the room and is a nice change. Raymour gave us excellent service in buying and delivery too! BEST ANSWER: Hello Mark. My husband and I purchased the white reclining living room set and we have a 5 yr old grandson, a 2 yr old granddaughter and 2 small dogs. Yes it will show dirt but keep in mind that all colors will get dirty. What we LOVE about having white is that you see it right away and can wipe it off. I use a damp cloth and it clean right up. My husband got black marks on a spot that I used mild soap on a damp cloth and it cleaned up easily. We love it and get so many compliments. Looks great and comfortable. Hope this helps. And also RaymourEmail made our purchase a very pleasure experience. Not really. We have this sofa since last 6 months and got two 7 and 10 year kids. but we didn't see any stains at all. and if by chance we get something, we wipe it and it goes off easily. really nice sofa. go for it. Yes it can get dirty. Because of the color you see everything. I find it very easy to clean though. is the 34" height prior to raising the headrest or after? BEST ANSWER: The height with the headrest fully extended is 42"